There are many quality crossover vehicles to choose from, including the 2015 Honda CR-V and 2015 Subaru Forester. At Middletown Honda, we’d like to help our Mechanicstown drivers with the search. We’ve put together a comparison of the CR-V and Forester to give you more information about these two compact crossovers. The LX comes with full power accessories, a 60/40-split folding and reclining rear seat with trunk-mounted release handles, a rearview camera, Bluetooth phone and audio connectivity, and a four-speaker sound system with an iPod/USB audio interface and Pandora internet radio compatibility. The EX, starting at $25,420,* adds keyless entry and ignition, automatic headlights with LED running lights, a sunroof, fog lights, a retractable cargo cover, an eight-way power driver’s seat, heated front seats, rear privacy glass, a blind spot monitoring system, a seven-inch touchscreen, and a six-speaker sound system with an extra USB port. Starting at $28,020,* the EX-L adds roof rails, an auto-dimming rearview mirror, dual-zone automatic climate control, heated side mirrors, leather upholstery, satellite radio, and a seven-speaker sound system. The Touring, at $31,520,* tacks on adaptive cruise control, projector beam headlights, driver seat memory settings, a power liftgate, a forward collision mitigation system, a lane departure warning system, a navigation system, and HD radio. The base model, the 2.5i, is priced at $22,195. Its standard features include full power accessories, a height-adjustable driver seat, Bluetooth phone and audio connectivity, a color multifunction display, a rearview camera, and a four-speaker sound system, an auxiliary audio jack, and iPod/USB connectivity. Priced at $24,595, the 2.5i Premium adds roof rails, a panoramic sunroof, rear privacy glass, a ten-way power driver’s seat, reclining rear seatbacks, and a six-speaker stereo system with HD radio. The 2.5i Limited, at $28,095, makes the All-Weather package standard and adds automatic headlights, automatic climate control, an adjustable-height power rear liftgate, fog lights, a rear roof spoiler, an upgraded instrument cluster, leather upholstery, a leather-wrapped steering wheel, and a cargo area tray. The 2.5i Touring is priced at $30,095 and throws in an eight-speaker sound system, xenon headlamps, keyless entry and ignition, dual-zone automatic climate control, and a one-touch folding rear seatback. Moving to the 2.0XT Premium ($28,495) comes with all of the equipment on the 2.5i Premium, plus a 2.0L turbocharged engine and CVT, dual exhaust outlets, the all-weather package, a rear roof spoiler, and a leather-wrapped steering wheel. The 2.0XT Touring costs, $33,095, and comes with many of the same features as the 2.5i Touring. 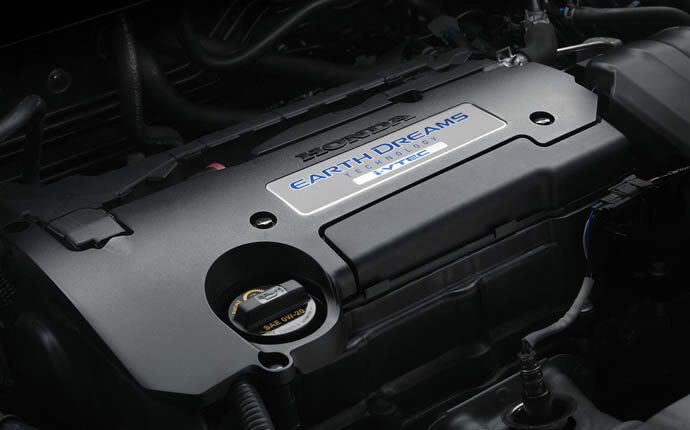 All trim levels of the 2015 Honda CR-V are powered by a 2.4L four-cylinder engine. It provides 185 hp and 181 lb-ft of torque and is matched with continuously variable transmission (CVT). Front- and all-wheel drive are available to Mechanicstown drivers no matter which trim they choose. 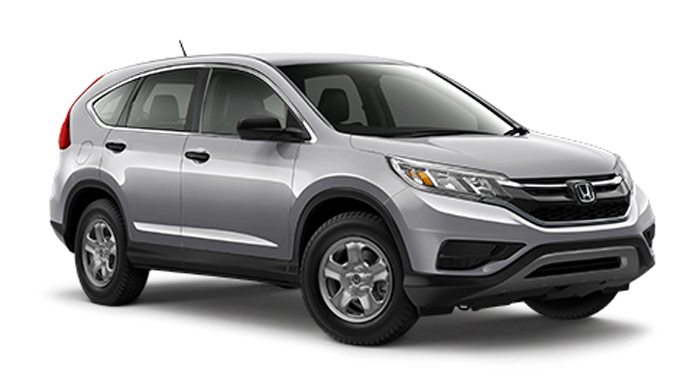 With front-wheel drive, the 2015 CR-V’s fuel economy is rated at 27 mpg city/34 mpg highway/29 mpg combined. 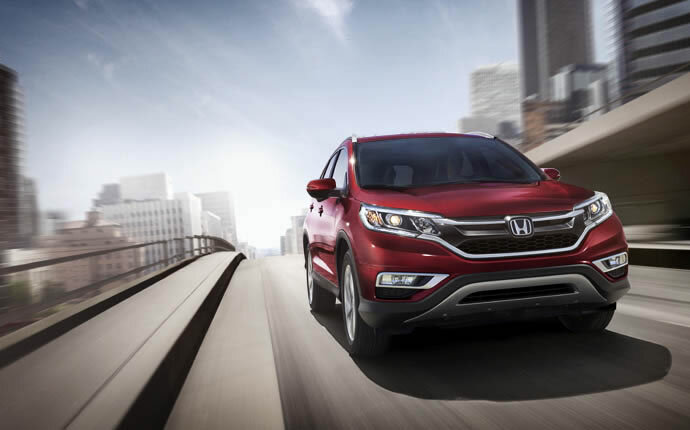 ** All-wheel drive puts the 2015 CR-V’s fuel economy at 26 mpg city/33 mpg highway/28 mpg combined. 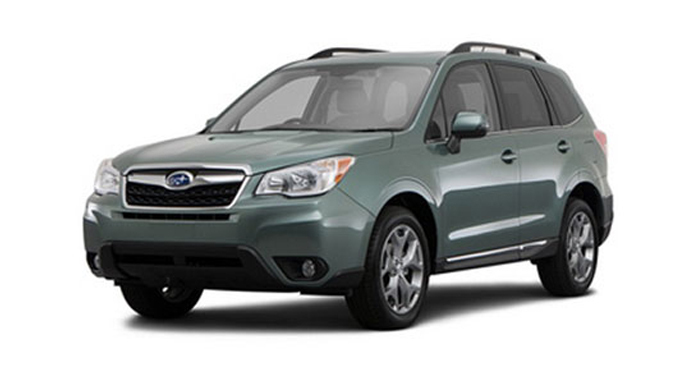 **Each trim level of the 2015 Subaru Forester comes with all-wheel drive and a 170-hp 2.5L four-cylinder engine. At the 2.0XT level, the engine is swapped for a 2.0L four-cylinder engine that provides 250 hp and 258 lb-ft of torque. The 2.5i and 2.5i Premium trims come with a manual transmission, while the rest are paired with a CVT. The CVT-equipped models achieve a fuel economy rating of 27 mpg combined, and the manual transmission models are rated at 24 mpg combined. The 2.0L engine on the 2.0XT manages 25 mpg combined. The Forester is only available with all-wheel drive. 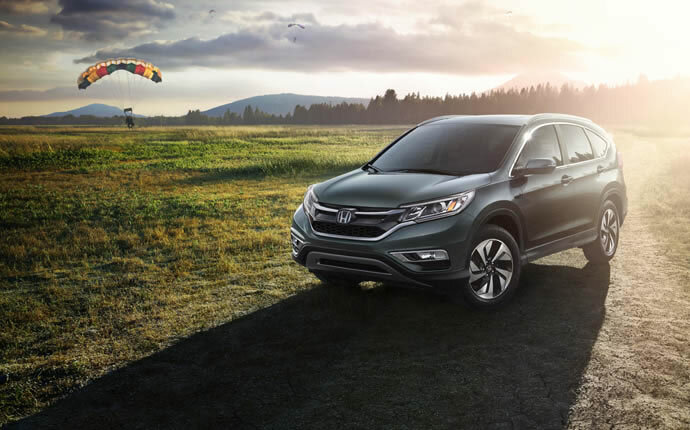 Not only does the 2015 Honda CR-V actually give you a choice of front- or all-wheel drive, but its efficiency is superior to that of the Forester, no matter the Forester’s configuration. The CR-V is a very practical cabin with a number of functional storage features, like a sliding center console armrest that hides a large internal storage space. 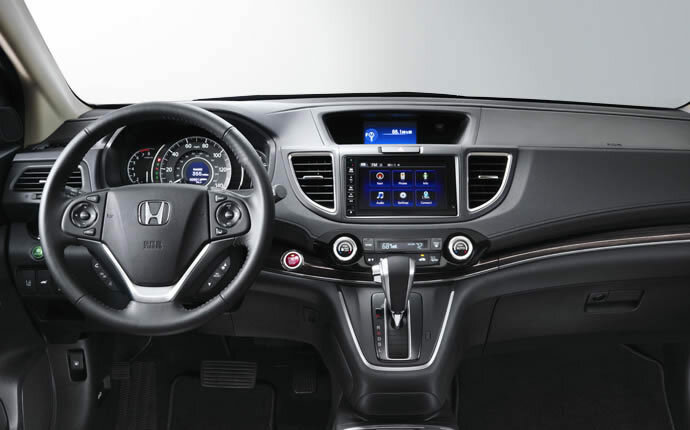 The CR-V’s controls are intuitive, and technology features like the rearview camera heighten convenience. You’ll also enjoy 35.2 cubic feet of cargo space in the back of the CR-V, which expands to 70.9 cubic feet with the rear seats folded down. Subaru keeps the interior design simple and straightforward, and the touchscreen interface and steering-wheel-mounted multimedia controls are easy to use. That said, we expect that you’ll miss some of the refinements and features of the CR-V. Both the CR-V and Forester come standard with antilock disc brakes, traction and stability control, front side airbags, side curtain airbags, and a rearview camera. The Forester adds a driver knee airbag, and the CR-V adds the LaneWatch blind spot monitoring system to upper trim levels. ** 27 city/34 hwy/29 combined mpg rating for 2WD. 26 city/33 highway/28 combined mpg rating for AWD models. Based on 2015 EPA mileage ratings. Use for comparison purposes only. Your mileage will vary depending on how you drive and maintain your vehicle.